We've officially entered Thanksgiving 2018 crunch time, and for those of us hosting friends and family this year, planning a menu can be...a process. 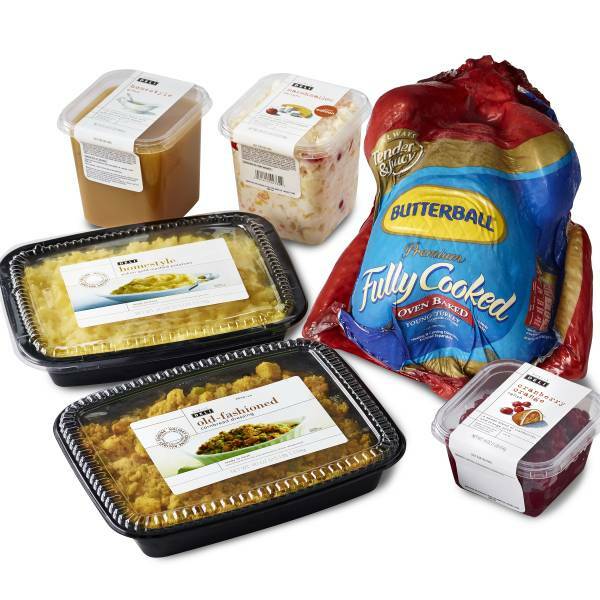 If you're short on time in the coming days, you might want to consider picking up a ready-made Thanksgiving dinner (everyone from Williams Sonoma to Cracker Barrel is in on the game) or meal kit—the festive, "fun aunt" to meal subscription services like HelloFresh and Blue Apron. Here, we've rounded up all of the best options you still have time to order, from boxes packed with pre-portioned ingredients and recipe cards to fully-cooked, ready-to-heat feasts. The Crowd: Serves 8 to 10. 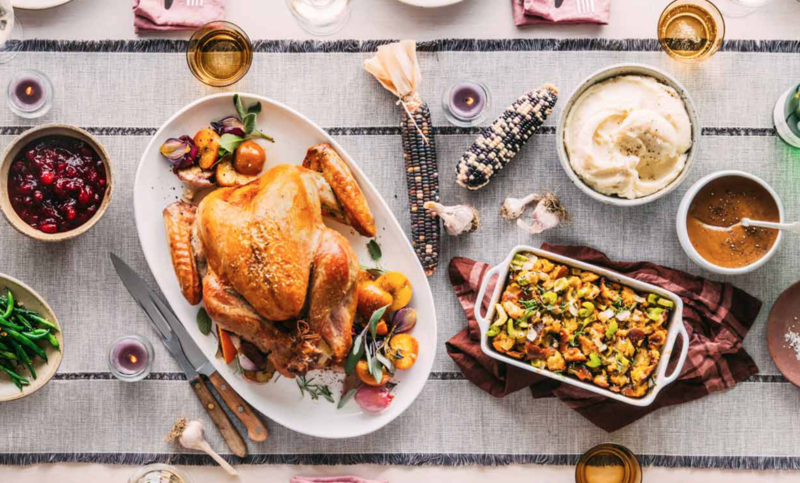 The Menu: Vero's cook-it-yourself Thanksgiving kit comes with a 10-to-12-pound DoubleStar farm-raised turkey seasoned with fennel pollen. Although, if you already have a bird, you can order a "Just the Sides" version of the kit for $110. Speaking of sides, you get everything you need to make fig, walnut, and sage stuffing, shallot gravy, blood orange cranberry relish, black garlic butter green beans with sliced almonds, marscapone and lemon mashed potatoes, and fiori mac and cheese. The Crowd: Choose between an 8-person meal (starting at $182) or a 12-person meal (starting at $350). The Order-By Date: Friday, November 16 by 12 P.M. 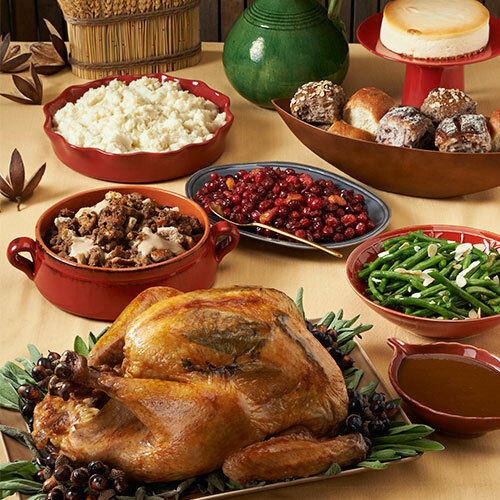 The Menu: Williams Sonoma's Thanksgiving dinner for eight arrives at your door with a pre-brined Willie Bird turkey, fully-prepped, ready-to-heat side dishes (green bean casserole nestled in creamy Gruyère cheese sauce, butter chive mashed potatoes), and a pumpkin pie. Dinner for 12 also includes sausage apple cranberry stuffing, and a pecan pie instead of pumpkin. 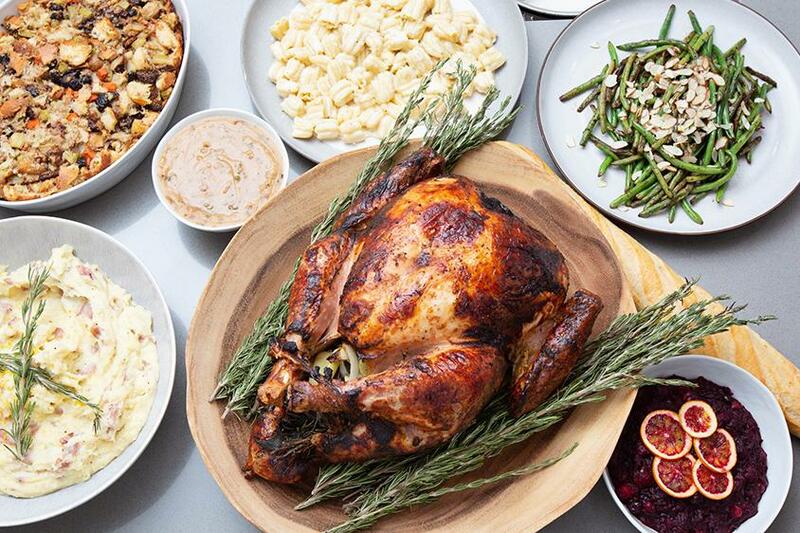 The Menu: This New York City staple—they ship nationwide!—has put together a fully-cooked Thanksgiving dinner that includes a roast turkey (11 pounds, minimum), chestnut stuffing, giblet gravy, cranberry salad, garlic mashed potatoes, string beans with almonds, dinner rolls, and a cheesecake. The Crowd: Serves 7 to 10. The Order-By Date: 48 hours advance notice are required before pickup, so it's best to order by Monday, November 19. 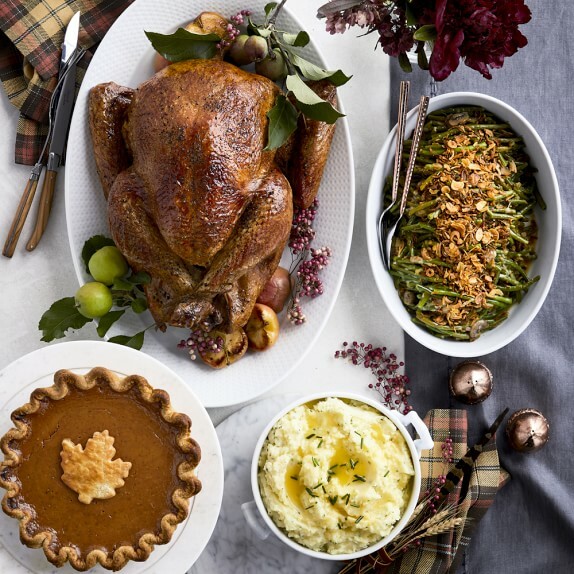 The Menu: A fully-cooked, grab-and-go option, this meal includes a 10-to-12-pound Butterball turkey, stuffing, mashed potatoes, gravy, cranberry orange relish, and something called "marshmallow delight." The Crowd: Serves up to 10. The Order-By Date: Cracker Barrel suggest ordering at least 24 hours in advance of your planned pickup date, so Tuesday, November 20 is probably the closest you can cut it. The Menu: Cracker Barrel brings it with the Southern touches. 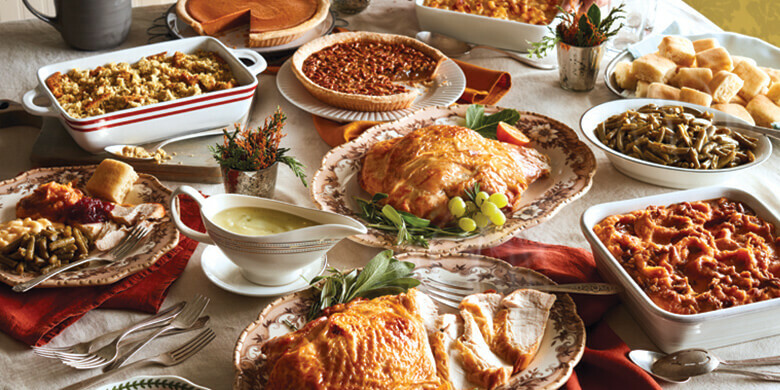 Each heat-and-serve family meal includes two oven-roasted turkey breasts, turkey gravy, cornbread stuffing, cranberry relish, sweet yeast rolls, pumpkin pie, pecan pie, and a choice of three country sides (some options include carrots, fried apples, green bean casserole, hashbrown casserole, mac and cheese, and mashed potatoes). The Crowd: Serves 12 to 14. The Order-By Date: Order online by Sunday, November 18, or in-store by Wednesday, November 21 for pickup. 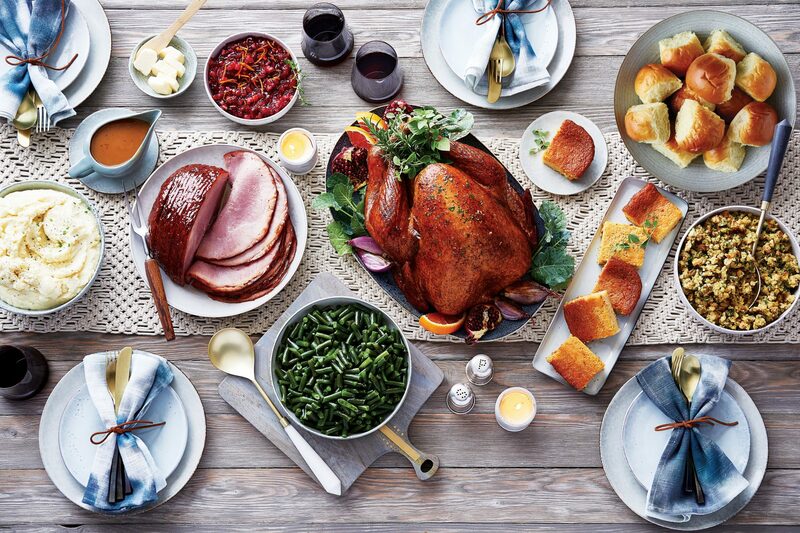 Fresh Market stores will be open on Thanksgiving Day from 8 A.M. to 3 P.M. The Menu: If you have a crowd to feed, you may want to consider Fresh Market's fully-cooked meal, which includes one 10-to-12-pound turkey, a three pound boneless spiral ham, Yukon Gold whipped potatoes, herb stuffing, turkey gravy, corn soufflé, green beans, cranberry relish with walnuts, and dinner rolls. The Order-By Date: Tuesday, November 20, for in-store pickup. The Menu: The stars of the show are a 14-pound roast turkey and a 7-pound spiral-cut ham with maple-mustard glaze (like everything else on the menu, they're pre-cooked and ready to reheat). Sides include creamy mashed potatoes, herb stuffing, green beans with crispy garlic and parsley, roasted butternut squash with cranberries and sage, creamed spinach and kale, gravy, cranberry orange sauce, pumpkin pie, and apple pie.